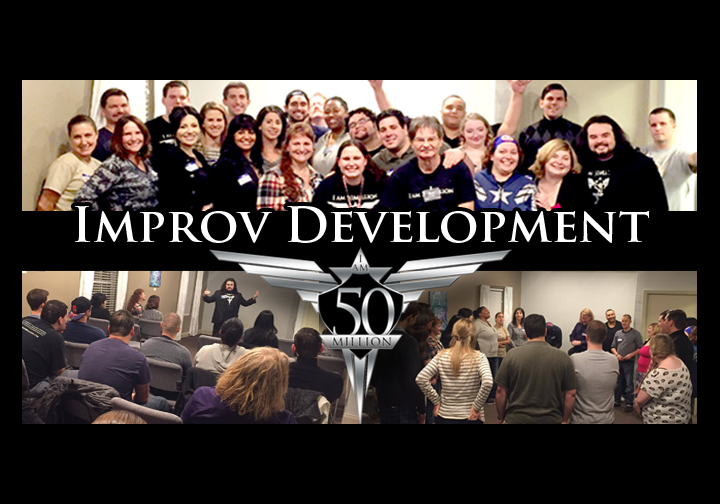 The “Improv Development” class is an “I Am 50Million” original concept that takes Personal Development to a whole new level. It incorporates many profound aspects of Personal Development and uses the art of Improv Comedy to create a fun way of putting them into practice. Improv Comedy (like the TV show “Who’s line is it anyways”) is so much fun but it’s even better because we teach it with Personal Development so that you get so much more from the class. This class is like a team builder and a fun acting class put together. This class will show you (through simple fun games) how easy it is to let go of fears, to be fully present, how to “flow”, how to make new friends, and how much fun it is to just be yourself. How is this possible? Because you will be surrounded by people from all walks of life that come together to meet new friends, to learn, and to have fun. You can come and watch or you can choose to participate. Either way, we guarantee that you will leave juiced about life and with new tools to take on your life challenges. Come out and see why thousands love this class and this group. Come out to meet new friends, have a great time, and learn Improv. This is one of our popular events. See you at Improv Development!!! I am 50Million, Paul Ortigoni, All Rights Reserved.